Going omni-channel in 2018 means setting up a number of repositories (PIM, DAM, RCU…) in your technical environment, and in particular an order orchestration system, also known as an Order Management System (OMS). Keep in mind how omni-channel sales are, by definition, more complex than single-channel sales. A multi-channel sales strategy can be defined as follows: each product must be available at all times on all sales channels, for each consumer inclined to buy it. This means offering online orders with in-store pickup or home delivery, as well as a hotline or click-to-chat feature to inquire about the order status. And why not also support the “new” channels, such as ordering via smart TV or connected appliances, chatbot order tracking… and any other conceivable combination between the “online” and “offline” worlds. As a result, retailers and warehouse managers need a system that is capable of tracking information and details about orders, pricing, multiple inventory levels, abandoned shopping carts, product storage locations, delivery times and costs, etc. Some of this information is also relevant to consumers, who expect being able to find it in a dedicated space such as “my orders” (at least on web or mobile). 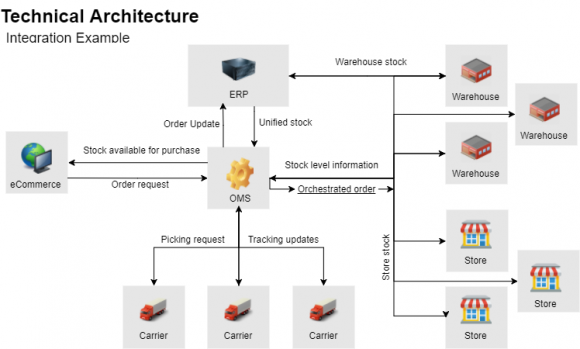 track and report on inventory planning and management and changes related to the order lifecycle. Some OMSs can generate real-time reports on factors influencing orders, such as bad weather or seasonal circumstances, to ensure that customers get their products as fast as possible. Concepts like the complete logistics process, such as freight auditing, freight classification, carrier selection, billing and payment completion are also supported by some of these tools. And finally, others are able to finalize internal accounting processes such as asset transfers, completed transactions and the use of promotional coupons. In a nutshell, the main purpose of this tool – the OMS – is to manage an order’s lifecycle and status from start to finish. This starts with the picking at the storage location, continues with the order preparation, and ends when the final delivery (in-store or at home) is completed. All online merchants have some form of order management, whether it is integrated into the online store or into a separate system. However, e-commerce sites that manage order status do so in a minimal way, exclusively on their own e-commerce domain, and flow optimization is only superficial. The same goes for Warehouse Management Systems (WMS), which are limited to their warehouses and are not usually designed for digital workflows and their specificities. But to go further and ensure an optimal omni-channel experience, it appears essential – and even crucial – to raise the question of a specific order repository offering a view of the entire supply chain. There is a wide variety of solutions on the market today, and systems are available for all business sizes and all types of needs. Inventory visibility throughout the supply chain and its ramifications (especially in the different warehouses, whether characterized as “e-commerce” or not, but also in stores), in order to guarantee the promise of availability. The tracking of all order statuses through delivery. 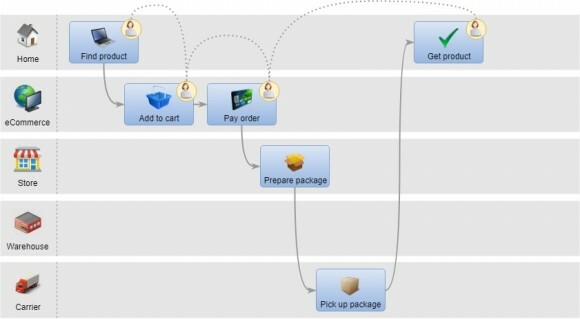 multi-package workflows (complete and incomplete), with the aim of automating the choice of the order preparation site(s) and inter-site supply in order to harmonize orders and optimize logistic flows (e.g., allow direct deliveries from suppliers to end customers). 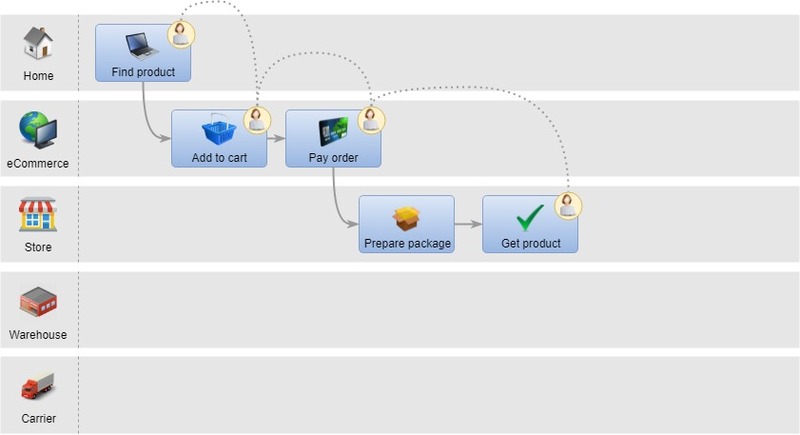 The possibility to set up an order validation workflow. Pre-orders & reservations management: to process orders that are placed before the product is made available / manufactured or while it is temporarily out of stock. Business rules integration: to prioritize and optimize product availability and delivery based on the requirements of the company. A dedicated customer service area or integration with customer service systems, making it possible to edit past and/or current orders if necessary. Validate whether an order can be fulfilled. Stock reservation: when the order is placed or simply when customers add a product to their shopping cart, the available stock is marked as “reserved” (this may vary according to business rules – for instance, in the case of a flash sale the product is reserved for a few minutes when it enters the purchase funnel, at the “delivery options” step). Sourcing rules: when a product is stored in multiple locations, sourcing rules must determine which fulfillment point an order should be allocated to. Visibility on the delivery journey is essential but also highly challenging to consolidate. This visibility can be obtained through integration with the single- or multi-carrier dispatch system and the mobile delivery agent for delivery status updates. When you go omni-channel, returns management becomes more complex with the addition of new package processing channels. Indeed, stores – or any other touch points where your products are available for purchase – must be able to handle package returns. Some OMSs process returns as an additional flow with the label “returned item(s)” and thus are able to provide an overview of packages in transit to a warehouse or store, marking them as new stock. It seems clear now that selling in an omni-channel environment is not an easy task. Integrating an OMS component into a technical environment is not without consequence. Aggregating and unifying stock level information, order requests and package tracking requires significant integration work to combine external data with the company’s internal data. This inevitably leads to reconsidering the way the information system’s internal (PIM, ERP…) and external flows (WMS if outsourced, third-party logistics system…) are organized. Click & Collect, a buzzword that has been around for some time, is about starting a purchase online and picking it up in a store. The concept is very easy to grasp, but quite challenging to implement. Click & Collect requires staff and a dedicated area to handle the influx of online shoppers eager to pick up their products in-store. This partly changes the paradigm in stores, which tend to become mini-warehouses. This means new tasks for staff members: receiving package deliveries or order requests, and preparing them. A change management process must be undertaken with store employees and included in the omni-channel strategic planning of any brand that started as a brick-and-mortar retail operation. Once the stores have assimilated the “mini-warehouse” aspect, we can go one step further in omni-channel order optimization by implementing ship-from-store fulfillment. Ship from store consists, instead of order picking in a warehouse, in having the carrier pick up the prepared package from a store. However, to avoid disrupting workflows, it is important to assess the logistical impact from the store’s point of view. In the case of a multi-carrier brand, this means that stores must have a suitable environment to accommodate all carriers – especially if there is a large number of products, if they are bulky or include valuables, if package pickups are frequent, etc. The added value of an OMS lies in the fact that it uses the information it holds about all storage locations to ensure orders can be fulfilled in terms of availability, cost and delivery times, and that it provides visibility over each order’s status throughout its journey by optimizing flows with predefined business rules. Without an OMS, this would be impossible to achieve. It is a true one-stop solution for reducing errors, delays and overhead costs associated with the management of product flows in an increasingly omni-channel world. Once you understand what an OMS is and why it fosters seamless omni-channel supply chains, you can give your company the means to compete in both the digital and brick-and-mortar commerce environments by providing customers with a high-quality user experience across all channels.